In August or September, towards the end of his term of office, the Mayor of Oxford would “ride the franchise”, making a circuit of the bounds of Oxford. In 1572 this was already described as an “ancient custom”. This time was chosen because by that time the corn would have been cut down, but the river would not yet be in flood. By the nineteenth century the Mayor and Corporation covered the route with a mixture of walking and boating. This route became longer over the years as the city increased in size, taking in St Clements in 1835. This was nothing, however, compared to the extension of the city to the east and south as far as the Boundary brook in 1889. In later years the perambulation was less frequent: for instance when Robert Buckell undertook the task in 1886 (just before important boundary changes), the last Mayor to do the same had been John Galpin in 1874. In about 1900, the custom of the Oxford Mayor riding the franchises ceased, and in 1929 the city became too large for a middle-aged Mayor to circumambulate. By the end of the nineteenth century, the riding of the franchise took place less regularly, but the ceremony in 1892 was deemed to be “of more than usual interest and importance”, because in 1889 the municipal borough of Oxford had been enlarged to match the parliamentary borough, and in addition a further 32 acres to the south of Grandpont was added to the city. The Boundary Brook now marked the city boundary to the east, and new stones were set up to mark the occasion, including two in Headington, on the present Woodlands Road and another on the London Road opposite the White Horse, and one on the Godstow Road bridge near the Trout. Because of the increased area of the City an earlier start than usual was made. At five minutes past eight in the morning, headed by the police band, the City flag and the great mace, the procession of Mayor, Sheriff and aldermen in full robes, set out from the Town Hall. The Mayor was Ald. Ansell and the Sheriff Mr. W. S. Carver. People joined in the procession as it wound along St. Clement’s, and by the time London Place was reached it had assumed “large proportions”. The first stop was made in Marston Lane opposite the entrance to Mesopotamia Walk where “the formal work” began. The mace and flag were placed on a stone in the hedge on the Headington side, three hearty cheers were given, led by His Worship, and the band played “God Save the Queen”. The Mayor made a little speech inviting all and sundry to accompany the civic party but warning them not to trespass on private property. The Mayor’s sergeant called for three cheers for the Mayor, which were “vociferously given”. Then they all had their photographs taken before the Mayor and his colleagues retired to Mr Morrell’s lodge close by and disrobed … “with a view, says the official recorder of the events of that momentous day, “of being able to move along more freely”. The disrobing, however, only extended as far as the scarlet and fur of their official gowns. At this point the police band retired, their places being taken by a flautist, Mr. W. L. Cox, and his son who performed on the drum. With the musicians playing the hit of the day, “Ta-ra-ra-boom de-ay” (“much to the amusement of the company”) the hill was ascended at an extraordinarily rapid pace, “many having to run to keep up with the officials who led the way”. To add to the discomfort of the more elderly and portly the weather was “exceedingly close” though later the clouds cleared and the sun shone. It was after crossing the London Road at Headington that the party got mixed up with a wasps’ nest while walking in single file along a ditch. However, only one man was unfortunate enough to be stung though most of the others were “discomfited”. At Van Diemen’s Land at Littlemore the Mayor had to burst into a sprint again to get on even terms with the mace-bearer and there was another incident while Cowley Ditch was being crossed. Several of the party slipped into the water while the feet of one, Coun. Higgins, “became embedded in the mud”. Crossing the stream by Weirs Mill, most of the party got safely over in the punts. But two unnamed persons were in such a hurry that they got wet feet. At Towle’s Mill in Abingdon Road a barbed wire fence proved something of a handicap, “leaving its mark on many of them”. After all these adventures it was pleasant, when Botley Mill was reached, for the Mayoral party to refresh themselves with rolls, cheese, pipes, and tobacco thoughtfully provided by the Sheriff. When the boundary stone was reached [this 1886 stone?] it was discovered that it had been overthrown. Standing by it were a party of 40 to 50 residents of what was then Wolvercote village. They included the Vicar and another gentleman in clerical attire. The Vicar protested to the Mayor against the procession walking on the Wolvercote side of the ditch. The Mayor replied, somewhat brusquely, that it might be imagined he knew nothing about the question. With “marvellous punctuality” the Mayor’s guests assembled for this “very pleasant interlude” which, to judge from the speeches which followed it, must have gone on for some time. The Rector of Carfax (the Rev. C. J. H. Fletcher) made two speeches which must have brought down the house to judge from the applause and laughter which punctuated his remarks. Next there was the traditional visit from the “King of the Sclavonians”, impersonated by one of the oldest Freemen of the City, who, after partaking of the grace-cup, presented a collecting box which was handed round. Then the party was on the move again. They did not go far before they had another stop in Banbury Road where the official party — about 100 altogether — were entertained to tea at the Sunnymeade residence of Mr. A. Wheeler, a former member of the Corporation. It was after leaving here — where the photograph [published in the Oxford Mail] was taken — that the “most amusing incident of the day occurred”. It was necessary to punt down the Cherwell. When the party was ready to start it was discovered that the weeds were too thick for the craft to be propelled along. The whole party had to disembark and walk downstream to where another punt was waiting. Cox, the flautist, went right under while the Mayor, “looking extremely dignified”, had to scramble out of the water which had wetted him “up to his breast”. The mace went to the bottom and had to be salvaged by some young men on the bank. There were surprises yet to come. The Marston Ferry punt had capsized, they discovered, throwing about 25 persons into the water, all of whom got out safely. A little further on they came on a drowning tragedy. A farm labourer had fallen into the river from a punt and men were still diving for the body. This sad occurrence “had the effect naturally of casting a deep gloom upon the spirits of the party”, and it was a very subdued procession which made its way back to the original starting point. Here they found a large crowd waiting together with the police band which, while the Mayor and his brethren donned their robes gain, played “Auld Lang Syne”. Crowds gathered along the route as they marched back to the Town Hall where “the proceedings came to a termination”, just after Carfax bells had chimed nine o’clock, with three cheers for the Mayor. 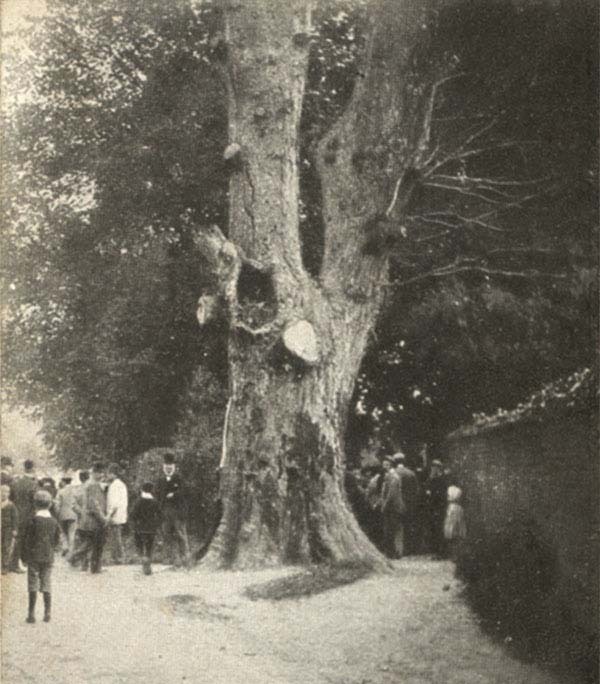 The picture below, taken by Henry Taunt, shows some of the 1892 mayoral party when they had reached Jo Pullen’s tree in Pullen’s Lane, Headington. The wall of Davenport House is to the right.